Oh how excited I am to bring you this review! I was lucky enough to host a giveaway for Of the Earth a few months ago, and I this time I also get to review a gorgeous piece! 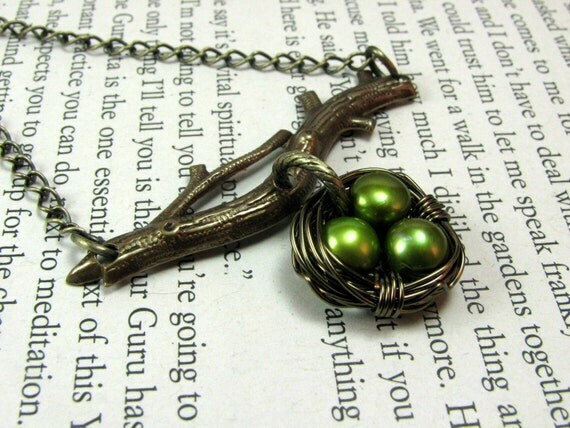 Randee, jewelry maker extraordinare, kindly sent me a "Nesting on a Branch Necklace". Now, I have six in my nest... and six eggs into a nest can be rather tricky. No worries! Randee succeeded in getting six little eggs into the nest! Isn't it lovely! I love the flower on the box, too...what a nice touch! This necklace is a nice, light necklace. It doesn't tug on your neck like some heavier necklaces may. I personally love that it is inspired by nature. I adore birds, nests, branches, and.. well, nature! So, this necklace was right up my alley, so-to-say. One great thing about Randee's jewelry is that she can really customize it for you. If you have a preference of wire color, or pearl color, or if you have a completely different suggestion, all you have to do is let her know! Of the Earth has recently "branched out" and now has some Verdigris bird jewelry for sale as well. I really think these are quite nice, too. Wanna buy? Head on over to her Etsy shop... and, if you order before May 8th, 2011, enter code MD2011 for 30% off! Well how about something free... Yes, that's right! 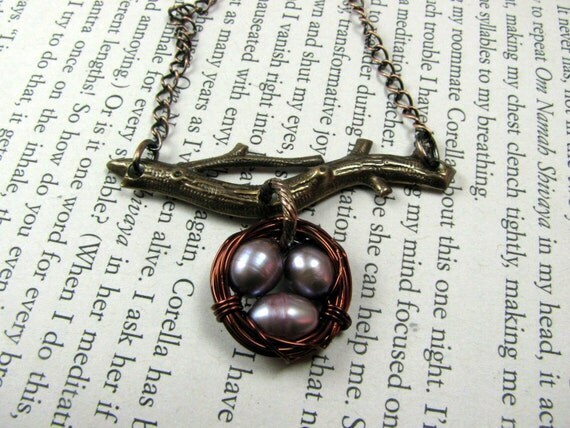 Randee has offered another Six in the Nest reader a chance to win a gorgeous piece from Of the Earth Jewelry! 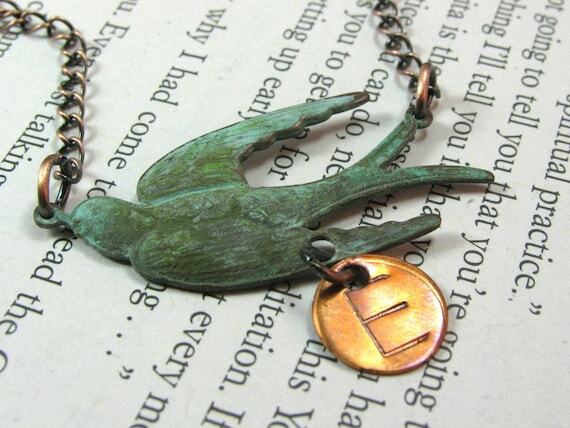 Follow the instructions below to win this small Verdigris Bird with Copper Initial necklace! 1 entry- Check out Of the Earth Jewelry and leave a comment here with the name and link of your favorite item! What a great shop! The Verdigris Bird on Leather Cuff Bracelet is my favorite item in her store. I entered the Bambo Nature Giveaway. What a fabulous giveaway! I just love the large bird necklace, along with the one you are giving away. Also entered the "Go Mommy" giveaway! This is definitely my fave! representing my three daughters! Beautiful! I seriously love Of The Earth Jewelry!! 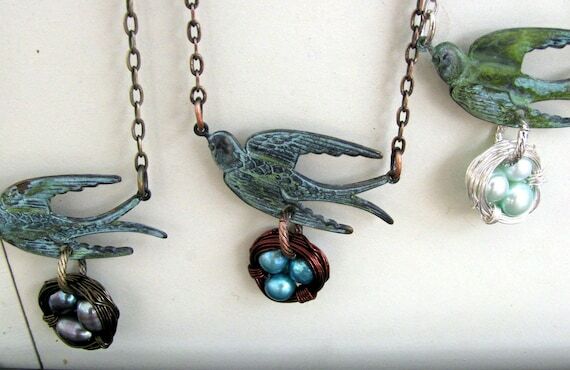 My favorite is Nesting on a Branch (with Copper Initial and Verdigris Bird)necklace! 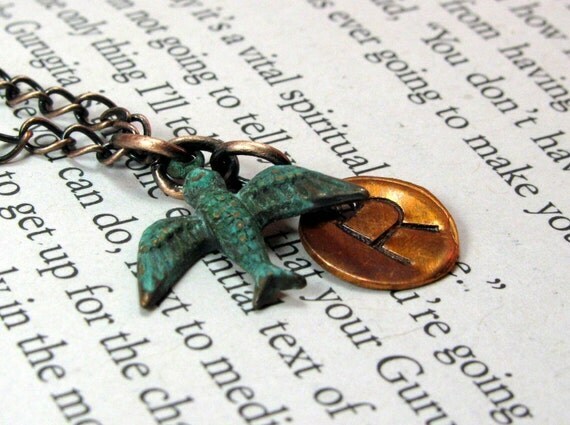 I actually like this necklace (Verdigris bird with copper initial necklace) the best! I really like the Verdigris Bird Earrings with Pearl Dangle earrings! I like Of the Earth Jewelry by Randee Hofmann on facebook as Wendy R.
Following @SixInTheNest on twitter as @ArtsyChaos. I like Six in the Nest on facebook as Wendy R.
I also left of the earth a message on Facebook that Six in the Next sent me. Thanks for a great giveaway! I now follow Six in the Next on Twitter. You can follow me back @SusanMcNeill ! Oh my goodness! I LOVE all her pieces! SO beautiful!!! I follow Of The Earth Jewelry's blog via GFC under lexacd! I "like" Six in the Nest on Facebook under Alexandra DiGiorgio! I voted for Six in the Nest on Picket Fence Blogs! I must say, all her pieces are gorgeous but I think I particularly like this one. My favorite item would be the Large Verdigris Bird with Copper Initial Bracelet! Like Of the Earth Jewelry on Facebook! wrote on Of the Earth Jewelry on facebook wall that you sent me! i posted about this contest on facebook! I entered the Infinity Pro by Conair Spin Air Brush Review and Giveaway! i shared this using the fb share button! I just voted for you on Picket Fence Blogs! i just tweeted about this contest! I just shared this on facebook! just voted for you on picket fence blogs! I voted on PF for you today. i now follow of the earth blog via gfc as meghansmom. i posted on otej fb wall that 6 in the nest sent me. 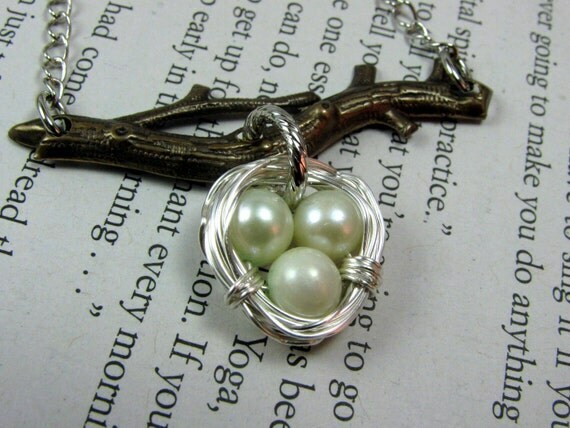 i love the Mother and Babies Robins Egg Nest Necklace Silver!